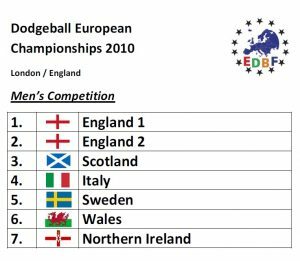 The inaugural EDBF Dodgeball European Championships featured 7 Teams from 6 Nations in a Men’s tournament. England took 1st and 2nd place with both their teams on their home turf in London. Also participating were the brave pioneers from Scotland, Italy, Sweden, Wales and Northern Ireland.